Are you up to 28 years old? Do you have a post-graduate degree? either in Greece or abroad? at the largest telecommunications group in Greece. Welcome to the OTE COSMOTE Graduate Trainee Program. A program designed to offer a unique career opportunity to 10 talented post-graduates who will be selected to join one of the most successful companies, a leader in its sector, living a unique work experience. It will be an exciting 18-month journey through the major business functions of the company, offering exposure to a modern work environment, training in the latest trends and concepts and assignments of challenging projects. We invite you to join an international work environment and develop your skills and talents. During the program, you will be supported by your personal Mentor & Coach. Your personal Mentor will provide you with useful tips and advice on your career, while the Coach will be there to guide you and help you accomplish your goals and grow on a personal as well as on a professional level. At the same time, you will follow a specially designed training plan that will prepare you for each step of the program. Your 18-month participation in the program will give you the opportunity to create a significant network of contacts and to regularly meet with the company's Senior Management. Do you wish to be one of the 10 OTE COSMOTE Graduate Trainees? We are looking for young individuals under the age of 28 who have a post-graduate degree in any field of study, with personal vision, passion and commitment to their personal growth. Extensive work experience is not required (0 to 2 years is acceptable), but fluency in English is essential along with mobility both within Greece and abroad. The program has been designed and is aimed at self-motivated, flexible and collaborative individuals, with potential to become future team leaders. You don't need any personal references, it all depends on you! Are you someone who will share this experience with us? 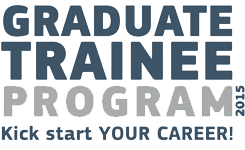 Find out more about Graduate Trainee Program job opening. Welcome On Board! The company welcomes you and briefs you on the main functions of the largest telecommunications group in Greece. Moreover you will learn more about our culture and guiding principles. In this part of your journey, you will experience the truly fast pace of the market, by meeting the most important success factor of our company - our customers! You will experience customer service in one of our stores and our call centres and will collaborate with our group's field technicians. This is the main part of the program, where you will learn about the core functions of the company as well as those business units whose work is equally important in providing a positive experience for our customers! Through job rotation and participation in actual projects, you will gain a better understanding of the structure and the operation of both our company and the telecommunications industry. In this part of the journey you will put theory to practice. You will have specific objectives, responsibilities and will be asked to give solution to real business issues. Through this experience you will have the opportunity to test your skills in various functions and to meet and work with a number of different individuals, under varied conditions and gain valuable experience. After 18 exciting months, your journey in the OTE COSMOTE Graduate Trainee Program will be completed. During this period, your results and overall performance will be assessed at every milestone by each of your supervisors, who will give you valuable feedback. At the same time, a special Senior Management committee will be monitoring your performance and achievements, and you will have an opportunity to present new ideas and proposals to them through the most significant projects you participated in. Provided you successfully complete all stages and requirements of the program, you will be offered a specific position in the group, depending on its business needs and your profile. As the leading telecommunications group in Greece, we provide excellent services and products by leveraging our technological pre-eminence, and creating unique and unforgettable experiences for our customers. We offer our people an outstanding work environment that provides the right conditions for personal and professional growth. It is an international career opportunity environment characterized by top performance, team spirit, collaboration and creativity. Our values are the foundation of all our activities. We encourage our people to work and operate while applying the principles of corporate responsibility in all of our operations. We perceive change as an opportunity for progress and innovation and we respect the diversity of our employees' skills, talents and experience. Be part of the strongest team! Create the future with us! you can apply online for the program through the site. Fill in all your CV data through the application. Upload a selfie photo that describes you best and state in one sentence “Why me”! Introduce yourself in a creative yet sincere way by adding personal details that will make your application unique. Tell us about your studies and skills and do not forget to share your interests, experiences and achievements with us, beyond a professional context. The selected online tests are conducted in English and are in a multiple choice format. Their aim is to assess the numerical, verbal and reasoning skills of all the candidates. Remember that these tests have a predetermined duration and specific deadlines. The good news is that you can choose when to take the tests! Do not be tempted to ask for help from someone else; these tests are designed to verify the consistency of the answers. Choose the appropriate time and place, hang the "Do not disturb" sign outside your door and you are ready to start! Have you ever taken a personality questionnaire before? If not, don't worry! This is probably the easiest part of the process, since these questionnaires are not about giving a right or wrong answer. Try to be spontaneous and respond as honestly as you can. This questionnaire will help you learn more about yourself and be better prepared for the next stages of the selection process. If you successfully complete all previous stages, you will be invited to an interview. At this stage of the process, we want to get to know you better; that is why we carry out the first round of interviews. Our experienced associates will explore some skills and behaviors based on your CV and the tests. You have already dedicated a significant amount of your time to us and we would like to offer you something back in return. Prepare for a complementary career guidance seminar that will help you explore your aptitude and talents. Your participation in the seminar is optional and will not be part of your assessment for the program. The interviews in this phase will give you the opportunity to come into contact and meet senior executives of our company in person. On our part, we will learn more about you, your skills and abilities, and about your values and what motivates you the most, not just through your professional experiences, but also through your studies and your life in general. You should make sure that you come prepared, but mainly be sincere. You should speak honestly about your personal vision, about the things that excite you and everything you have achieved to date, referring to real examples. We will ask you to share real experiences, feelings and events with us. You are one step away from success! You have succeeded in becoming part of the Assessment Center, which will be held in Athens. The Assessment Center lasts for one day. It is an intensive day, so we advise you to be well-rested and to put your best foot forward. We want you to experience this day by discovering more about yourself and the way you work as part of a team. Your day will include a number of different individual and group exercises which will make up your overall profile. Do not be disappointed if you feel you did not do so well in a particular exercise; there are other exercises and they are all important. This is a wonderful and useful experience for the next step in your professional career, regardless of the outcome of your candidacy. Did you just find out you are one of the 10 OTE COSMOTE Graduate Trainees? Get ready for the best start to your career. Become a member of the most successful team! the program or the process selection? What are the criteria and requirements for participating in the program? We are looking for young people up to 28 years old who have a post-graduate degree and wish to work for OTE and COSMOTE. There is no need for a work experience, however you should be fluent in English and mobile both nationally and internationally. If I do not meet some of the position's requirements, will I be disqualified? The minimum requirements that have been set, are mandatory in order to ensure that the selected graduates will be able to cope with the role and the program needs, as well as the trainings they will participate in. Can I apply for the program if I have not finished my studies? We accept applications from individuals who have completed their post-graduate studies. Am I required to have completed my military service in order to apply? Yes. We wish the graduates to fully immerse themselves in to our company right after the completion of the selection process; that is why we require all candidates to have completed (or been exempted from) their military service obligations before the start of the program. Do I need to provide references in order to get in the program? You don't need any personal references, it all depends on you! Which is the selection process for the OTE COSMOTE Graduate Trainee Program? The selection process consists of six (6) different stages: 1. Online Application, 2. Online Aptitude Test, 3. Online Personality Questionnaire, 4. Interviews (stage 1), 5. Interviews (stage 2), and 6. Assessment Center. More information is available in the "Selection Process" section of the site. The application deadline for the program is the 30/12/2014. Please note that we may contact you before the completion of the application process. We will contact you via e-mail. For your convenience, we advise you to submit your application early. What should I upload as "Attachments" to the online application? In order for us to get a good impression of your educational background and professional experiences we encourage you to attach your CV. Make sure your contact details are correct. If they change during the selection process, please let us know. What should the content of the "Why me" selfie sentence be? The purpose of the "Why me" question is to give you the opportunity to express yourself in a more direct manner through a selfie, choosing what you believe best describes you so that we can form a first impression of you. In other words, we want a photo with a sentence telling us why you should be one of the 10 OTE COSMOTE Graduate Trainees. Although this part of the process does not exclude a candidate, it is mandatory. How should I prepare for the interviews? We want you to come to the personal interviews prepared, but mainly to be yourself. You should sincere about your personal vision, about the things that excite you and everything you have accomplished to date, referring to real examples. We will ask you to share real experiences, feelings and events with us. The interviewers will seek to learn more about your skills and abilities, your values and your motivations; not just based on your professional experiences, but also on your studies and your life in general. Can I get some feedback, even if I am not selected for the program? Our aim is that every candidate experiences the process in the most developmental way. In this context we make sure you receive feedback in every step of the selection process, with updates about your status and useful developmental tips. The program begins in April 2015. If I am selected as a Graduate Trainee, when will I be hired by the company? Those selected for the program will be hired by the company with the beginning of the program. During the program, the main functions you will be working in will be at our offices in Maroussi, or at one of our buildings in Attica. It is important that you are able to move to Athens if you are not a resident of Attica. There is a great chance you will be asked to undertake a project in any part of Greece while staying there. You may also need to travel both within, and possibly outside Greece. What support will I receive during the program? The program follows an integrated approach to development (blended learning) consisting of a combination of training programs, assignments and on-the-job trainings. At the same time, Graduates will have their personal Mentor and Coach who will support them both professionally and personally. What training and development methods will I be offered during the program? During the program, you will follow a specially designed course of specialised trainings and special development programs aimed at providing appropriate preparation and support so you can successfully meet the demands of each phase of the program. What will I do during the first three months of the program? During the first three months, you will experience working with customer service teams and field technicians and gain hands-on experience at one of our company's points of sale. You can find additional information in the section "Program". What will be the salary of the Graduate Trainee? You will receive a very attractive remuneration package and special benefits. All details regarding the remuneration package will be shared with you during the final stage of the selection process. Will I be entitled to annual leave during the program? Yes, as an employee of our company, you are entitled to annual leave (on a pro-rata basis depending on hire date). What will happen after the completion of the program? Every time an important experience phase is completed during the program, you will be evaluated by each supervisor and receive valuable feedback about how you can become even better. At the same time, your performance will be evaluated by a special Senior Management committee. Depending on your overall performance and once you have successfully completed all the stages of the program, after 18 months you will be offered a specific regular position within the OTE group. Do you have any additional questions on the Graduate Trainee Program? We are here for you!